Cooking for men by men for just a fiver! 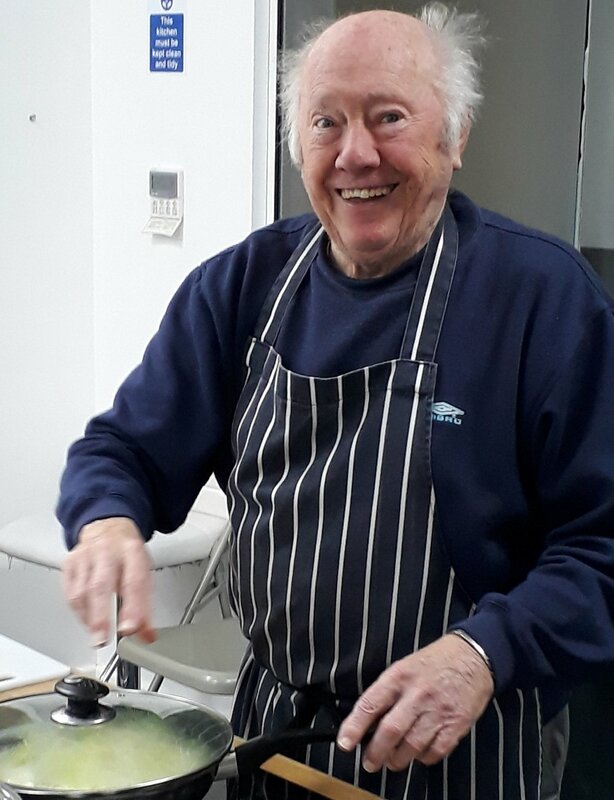 You will be in a small group with our 2 male instructors, David and Trevor at the training kitchens of Pompey in the Community on Anson Road, just behind Fratton Park. The 5-week course takes you from some basic kitchen practices and recipes through to some more complex dishes, culminating with everyone’s favourite - chicken curry, perfect rice and Bombay cauliflower. The first course of 2019 starts Tuesday 15th January at 10.30 til 1pm and costs £5 for the whole course. That’s £1 per week - much cheaper than a pint! Ingredients and aprons provided, just make sure you bring a Tupperware box or similar to take home what you cook. For £10-15m - a fraction of the cash winding its way to the DUP - the government could fund the redistribution of 100,000 tonnes of edible surplus food and drink per year. Good, tasty food currently ending up in the ground, spread on crops or burned in incinerators could instead be eaten by some of the UK’s most vulnerable people, while saving the charities on which they rely hundreds of millions. Carrying on from the sucess of last year's holiday lunch project, we will be supplying food for lunch once a week to each of the city's six adventure playgrounds during the Easter holidays. This tasty hot meal will consist of jacket spuds, beans, cheese and fruit, and ensure that no kids go hungry. We will also be extending our offer to the 4 youth clubs in the city - to ensure that no young people go hungry either! New Courses for beginers and intermediates starting in 2018. The event will take place in the Third Space, which is the first floor of the Students’ Union building (PO1 2EF). The building is access friendly and there is lift access up to the room. The event is open 12-3pm . If you care about volunteering get down there and just do it. Men's 6-week cooking course - for men, by men. Cook; Dine; Chat @ Pompey in the Community Centre, Fratton Park. Abundance Portsmouth will be holding their first Apple Pressing Day on Sunday 3rd September. We will be at Eastney & Milton Allotments helping allotment holders crush and press their apples and pears into delicious juice. Surplus fruit will be collected to use at community and school events, as well as getting some of it into the foodbank and community kitchen network. We could do with some extra volunteers to help on the day with harvesting and helping folks make juice, so please do get in touch if you can spare an hour or so and enjoy some fresh air and community fun. We'll be at Eastney & Milton Allotments on Sunday 3rd September, next to the shop, setting up at 9am. It would be great to see you there!